There are times when you are certain that your dog has an emergency (ie: hit by a car) and there are times when you are very concerned but not convinced that it is an emergency requiring immediate care. When in doubt, head to our emergency hospital during regular business hours. If possible, call on your way to let us know the type of emergency and if you will need assistance getting into the building and your E.T.A. In a time of crisis but not during regular hours, 4 Paws Veterinary Care will have you take your dog to Upstate Veterinary Specialties and Emergency Hospital if we are closed. It is located at 152 Sparrowbush Road in Latham, NY 12110. Their phone number is (518) 783-3198. 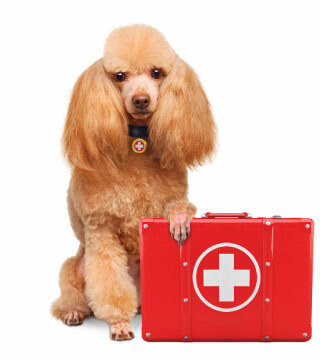 After your dog is treated at the emergency hospital, the emergency vet will work closely with your primary veterinarian at 4 Paws Veterinary Care if any further care is needed. Do your best to remain calm and have a passenger hold the dog while you drive. We are staffed and equipped to handle all types of emergencies. Emergencies are very stressful and it is important that you do your best to remain calm. Your dog will be soothed by your ability to remain calm and speak in a calming tone while driving it to the hospital. Some types of situations may concern you, but you may not be convinced your dog needs immediate care. In these cases, it is still best to err on the side of caution. Please call an emergency veterinary hospital. If you decide to call, our staff will do our best to help you decide the best course. Unfortunately, dogs will quite often mask symptoms and it may be difficult to determine the seriousness of the illness. We are here for you and will take care of your dog in the best way possible. For external bleeding due to trauma, try to elevate the affected area, and apply direct pressure to the wound. Most importantly apply firm, gentle pressure with towels and keep pressure applied until you arrive an emergency hospital. Placing pressure over a wound will help to stop the loss of blood. For choking emergencies, attempt to remove the blockage but avoid being bitten due to fear on the part of your dog. Be careful to not push the blockage farther back into the throat. First call animal poison control hotline at 1-800-213-6680 then go directly to the veterinarian. Bring the bottle or know the type of medication or poison ingested. Call on your way in and tell them what the dog ingested and how long ago it was ingested and the amount ingested.